The photograph below, courtesy of Brenda Walker's post, comes from the LA Times story, California's unemployment rate shrinks - but so does the number of jobs. It's from the Glendale Unemployment Office, and I didn't recognize the characters in the third line. I knew they weren't Cyrillic, Arabic or Hmong, and it didn't seem likely that they'd be Klingon. What group, I asked myself, is large enough and unemployed enough in Glendale to merit this trilingualism? It turns out to be the Armenians. While Armenians from before the 1924 pause are totally assimilated—consider Ara Parseghian, Aram Bakshian, and Mark Krikorian—the more recent Armenian immigrants aren't assimilated at all. 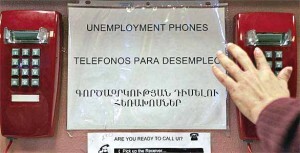 William Saroyan's parents weren't demanding Armenian language signs in the unemployment office, because in 1908, there were no unemployment offices, and immigrants who were unable to support themselves could be deported as a public charge. Now Glendale, CA, has the third largest Armenian population of any city outside Armenia itself, after Moscow and Los Angeles.